If you want an oasis, start pulling up the weeds. Dig some more, and find the roots. You can plant more of the plants that you love. You can fertilise the plants that you love. You can prune and shape the plants that you love. But unless you address the weeds, your garden will continue to grow into a tangled mess. Those suckers use nutrients in the soil and take up space. You can spend all day pulling up the weeds you can see, and yanking at the roots... And guess what? Tomorrow another weed will appear. One that had laid dormant under the ground until you made space for it to grow towards the light. Then you’ll pull that one up too. Because growth never ends. You can count the weeds or you can enjoy what is unfolding and how far you’ve come. Like life, comparing your garden to someone else’s is futile because you don’t know what weeds and poisons they had to overcome before designing their landscape and planting their seeds and saplings. You can only create from where you’re at with the tools and soil/soul you have right now. 2018 was one of my worst years ever. If my life in 2018 was a garden it would have looked like someone was digging a quarry with random piles of earth in parts and a complete quagmire in others. Finally the seeming annihilation brought me to a point where I could see the foundations of beliefs that had brought me to these situations. My choices had lead me to here because I had either been unaware of any other options or that I deserved anything better. An oasis doesn't just grow out of nowhere. We’ve gotta do the work, pull the weeds, prepare the soil and invest in something that will thrive in that habitat. As 2019 unfolds, those deep ditches provide a scene on which to prepare new landscapes. Landscapes which provide aspects and microclimates to sow new beginnings. You never know what might flourish in that space where you just pulled that weed from. It might just completely change your outlook. T’is the season for tradition. Because that’ s what we do. There’s nothing like good ol’ tradition to perpetuate the status quo. Christmas and the end of the year brings us together for infinite catch-ups and sends many of us into a flurry of buying to give for the sake of giving something.We've all done it and we've all received it. The afterthought present. "Sh*t! What's in the present box? I forgot to buy something for ...."
The façade goes on and on and on. T’is the season for get-togethers. We joke that Christmas brings out the best in people and that can be true. Strangers wishing each other a merry Christmas or Happy New Year as they pass in a street. And then there’s the flip side. The disfunction brought of expectation, judging and pigeonholing. We put on the face and whatever costume we choose to define us and show up to the gathering of people who know us best (or who we expect to know us best because they’ve known us the longest or they’ve known us through some hardship or other). I’ve been working on a lot of projects at once in recent months. Some of which will never be mentionable beyond the vault of a solid friendship. All have had their challenges and forced me to question my priorities and values. Each time I have entertained someone else’s idea of expected outcome, life threw me another random issue to deal with. Staring down the barrel of uncertainty in so many areas of my life in the same breath, forced me to make unexpected choices. Choices that others clearly, and vocally, thought were absurd. But we’re taught to trust our peer groups or family. We’re vulnerable because we hope that they see us and trust they really understand us. That when life feels like utter turmoil we support each other. Isn’t that how support networks work? It’s well documented that many of the human needs such as the needs for power, intimacy, approval, achievement and affiliation, are all driven by the need to belong. If you’ve felt it, you’ll know there’s nothing more lonely than being with people who don’t see you for all your worth. People who judge you based on validating their own choices. T’is the season for reflection. Of the past and the present. What if the season of New Year Resolutions was also one of owning our choices? T’is also the season for choosing. You can choose to drop the expectations and decide how and where you belong. * Baumeister RF & Leary MR 1995, ‘The need to belong: desire for interpersonal attachments as a fundamental human motivation’, Psychological Bulletin, May, 117(3), p497-529. A huge Thank you Kinderling Kids' Radio for featuring Peanut Monkey up High as Story of the Week. A special shout-out to Cinnamon, Elise and Max for recording, producing and post-production. Head on down to Kinderling Kids' Radio for family-friendly kids radio for children and their grown-ups. Maybe it’s part of the human condition, to want more. Maybe it’s a reflection of our society, to compare and contrast. Over the last summer holidays, despite deliberately not showering my children with what I thought was “too much”, attempting to teach them to value what we already have as well as simple pleasures, and also that we don’t actually to have everything that everyone else has, they wanted more. One fine day of weakness and feeling the latest thing the kids wanted was actually something they’d use a lot, I bought it for them. A surf board we would get a lot of use with, but the request hit me. Enough was never going to be enough because there was always the next thing. Was this a request, or an expectation from my kids? Underneath the request for the surfboard, I felt the insidious creeping of entitlement and decided this needed to be addressed. Urgently. Travelling and seeing young children who have pretty much nothing, play joyfully with what they do have, has influenced my parenting. Many house-moves has also contributed to my outlook of wanting to keep things simple and as minimalist as possibly with two active, creative children. The world of entitlement is not exclusive to children. Was it the fairytales that brainwashed us? Entitlement pervades our society in people’s expectations of others. Often seen as “should-ing”. I have recently experienced the displeasure of, again, not meeting someone else’s expectations. Expectations that weren’t communicated prior to the “shoulding”. Shoulding implies someone else’s choices are worthless or that they “should” do, be or choose something complying to someone else’s judgement. Imposing a 'should' on someone is an aggression. It is an attempt to control. If the interaction isn’t a fair exchange, then what is it? The fair exchange may not be immediate, there is always give and take at different times within any relationship, but overall, repeatedly being drained of resources or energy is not a fair exchange. In the age of entitlement, whether it's expecting someone should be a certain way, make certain decisions or provide something for you, the only way through is being responsible. Responsible for your own choices, reactions, and owning your intention. Everything else will fall in to place. In my children’s books, my intention is to show children what control and disfunction looks like and introduce vocabulary and an example of a skill to deal with situations. When you write your own fairytale, the ending will be better than all that other trite you’ve ever read about and allows a sense of inner freedom. Go on, write your own next chapter without the 'shoulds'. Let me know how it makes you feel. This (photo) is the face of I don’t want to. The face of no choice. A wise friend once said, “You get what you put up with.” He said it with a voice of experience. So I made some changes to what I was doing and walked away from a situation back then. And many other situations -and people- since. After a long, continuing journey of further suffering leading to more growth, I have learnt that it serves no one to put myrself last to others’ expectations or demands nor accept anything less than respect. What our children experience repeatedly becomes their normal. I struggled with what was becoming our normal and as my children challenge me constantly, I started questioning my decisions -even more than I was already beating myself up for previous decisions. When I decided that I too, deserve respect and to be to be heard, and that didn’t happen, then my path really did need to be the ‘highway’. If I didn’t have a voice in my relationships, then it has served me to leave. One way to change the world is to teach and model a new normal. I often challenge my own normal. Is this what I want or deserve? No? Then I change it. Putting up with it only perpetuates disfunction. Trite such as ‘work on yourself and everything will be better’ (in the same relationships), as ‘celebrated’ by the eternal happiness brigade, does nothing to encourage accountability nor responsibility for owning our own part in the demise of relationships. It seems life throws me in to situations to challenge the status quo, and what I’ll put up with. Intentionally or otherwise. So I learn what I need to learn and move on. Sometimes life throws us stuff to either learn the lesson or teach others what we’ve learnt. I model what I’ve learnt to my children, as best I can at any given time. Often I model it badly (in my head, that's what it seems). Or maybe I’m just human. I’ve come to accept it’s OK for me to fail, even in front of my kids. My most important effort is to work through things and help my work their out their issues, focussing on resolution, while holding true to our standards of respect and negotiation. What I do know is that children need to feel heard and honoured too. They know what supports them and what doesn't. Children deserve to have choices in their lives about what they should and shouldn't be made to do. I have no nugget of wisdom to impart on this, I’m too busy dragging myself out of the gutter of self-judgement and analysis to tell anyone else how they should do it. If I did have something to say on parenting, it might be: just do what you do with love. And flexibility. And humour. Always humour - when appropriate. We’re all in this together, let’s support each other in our growth and understanding, eh? *Using the word ‘relationships’, I refer to all relating; friendships, relating with co-workers, as well as intimate partners. In the midst of a(nother) house-move, I contemplate where is our next home? And, indeed, what defines it? In the packing of the things, I posted stuff to family members. Inherited stuff I realised wasn’t mine to guard or hoard, especially if I didn’t use it. I posted stuff back to people who had left it at my place when they’d come to visit. And I disposed of anything that wasn’t treasured or used regularly. Every day I donated bags of stuff to the charity shop. Well, at least one bag, often a bag and numerous other items that didn’t fit in the bag(s). Because the endless stuff doesn’t make it a home. All the clichés, Home is where the heart is, Home is where you lay your hat etc don’t even scratch the surface of what home really means. In the recent doco Filthy Rich and Homeless, five wealthy people volunteered to live on the streets of Melbourne for 10 nights. Despite the experiment set for a finite period of time and the intention behind the TV show to highlight the plight of Homeless people, the very quick decline in the states of mental health of the volunteers was surprising. These volunteers had lights at the end of their tunnels of homelessness, and opulent lifestyles to return to after the experiment, but their psyches broke. They had support workers and health professionals check in on them, as well as a camera crew following them around. But there was something about not having a base, nor a lifeline to familiarity, even temporarily, that affected them deeply. Is Home even a geographical location? Maybe the feeling of Home runs deeper? What I aspire for my family is for Home being where we’re safe. Safe to make mistakes. Safe to say “sorry”. Home is where it is safe to grow. Home is a soft spot to land. Home is where we get to to have a voice and be heard. Home is where we work through things to resolve them Home is where we’re accepted for our imperfections. But, it starts with self. If you can’t accept your own imperfections, and then project that something (or everything) is someone else’s ‘fault’, or complain about someone else without addressing them, then that’s not a safe environment for growth. And that is how Home is where the love is. Home is where you love yourself enough to own your mistakes and grow. To love yourself enough to leave when you’re stifled and there’s no other way through. There is always an autobiographical element I bring to my children’s stories, Peanut, on a mission to find his place in the world. So, are we there yet? In the finding of a new house to live, we’re here, exactly where we’re meant to be, even temporarily. I found Home is an inside job, not a just a physical locale, transient or otherwise. Under cloaks of mediocre expectations. I am Goddess of last minute anything. One friend comments how often we have a conversation and I say something like "I completely turned it around! ", usually at the last minute. The book four illustrations arrived last week and coincidentally, I was working on another project with someone else and we were discussing how book four fit in to the series. I’m still wrangling with how to extract and describe book four’s lessons. That manuscript typed itself so easily & screams of being autobiographical, but what of the lesson(s)? I question if indeed there is a lesson or if it is pure whimsey and distraction. In the book Peanut goes on a journey taking him deep inside the mushroom. He meets a couple of minor challenges, but nothing life-changing, and then he ends up where he was. Happy. Although he was already happy. His initial call to action was nothing more than his curiosity. But his curiosity didn’t get him in to any trouble as such. Maybe the lesson is that sometimes the journey takes us on a tangent to show us something so when we come back to what we love, we appreciate it more. It’ll come to me. Probably at the last minute. Today I had the privilege of storytelling to the grade 2s at Cowes Primary school. We discussed resilience, failure and strategies of handling big feelings like when "I feel like my body is going to explode" said one boy. We also explored why we wear bike helmets and why Peanut Monkey isn't wearing a bike helmet in the beginning of the story- well observed by one young lad! Thank you for such an interesting morning and great questions grade twos! VCPSCSO005 relationships: practise skills required to include others and make friends with peers, teachers and other adults. VCHPEP061 relationships: identify and describe emotional responses people may have experienced in different situations. 'Just Keep Swimming Dory.' Oh, and Look, Book Number FOUR! Just wow! This year just gets better and better. I won't sugar-coat it, it's been nothing short of tumultuous and is certainly giving 2011 a run for its money. Life has, at times, seemed overwhelmingly chaotic and of course, again, I'm still making inroads and still striving to follow my passion to encourage resilience and courage through children's stories. It's taken me so long to realise the irony that nothing is in my control, yet everything is. There is nothing I can do when the process(es) is/are unfolding but to control my focus. Am I feeding the distraction? Am I feeding my fear? If there was a best outcome, where do I need to focus? This new book, Peanut Monkey and the Mystical Mushroom, my fourth (self-)published this year. Again Bruce and Sophie have exceeded my expectations with their illustrations. And also, in true author styley, I'm putting the last finishing touches to the manuscript when the illustrations are already finished. Just when I was thinking of getting a proper job, another breadcrumb in direction of my path to my future. I'd better take notice, because some of the breadcrumbs are now glow-in-the-dark cobblestones. I may still take that proper job in the interim, but that light at the end of the tunnel is brighter this week, propelling me to keep marketing, building, connecting and 'just keep swimming Dory'. Maybe I'll write a line like that one day. One that people repeat to themselves to spur themselves through adversity. Meanwhile, today, this year keeps getting better and better. Being a self-published author means I am constantly creating awareness of my books and looking for opportunities for storytelling and engaging children in finding their own solutions. I am super-lucky to have a wonderful network of friends who are willing to help support me and my ideas (read, "antics"). Speaking of friends, one friend went to Berlin last week and took some books to donate or leave in random places for people to find. As it happens, Berlin has a giving culture and there are such things as giving boxes around the city where people donate what they want and others take what they need, so finding random gifts is not unusual. 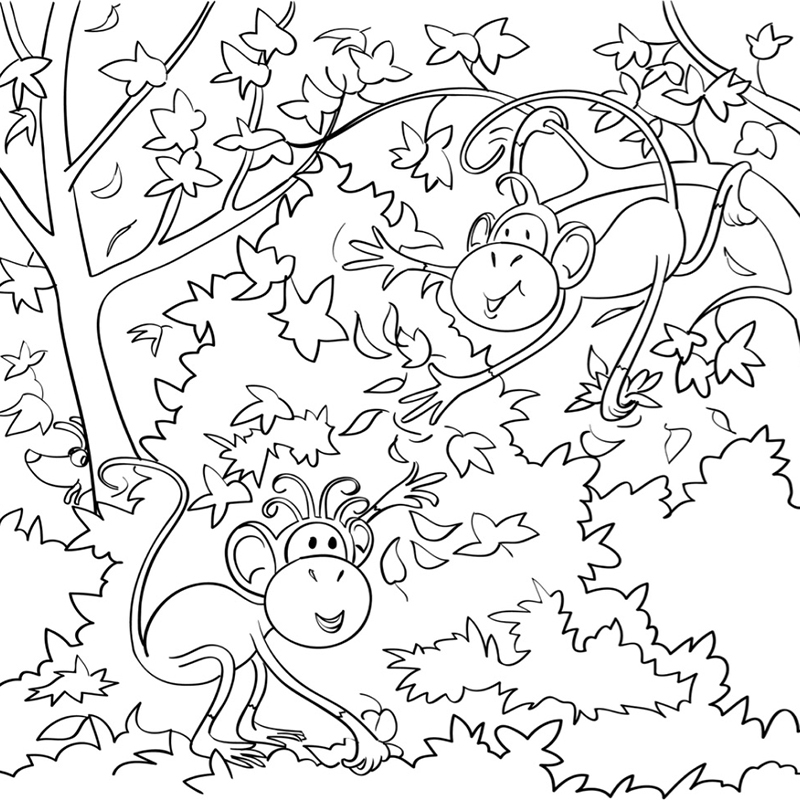 She left Peanut Monkey Up High in the branch of a tree and sat back to see if someone would find it. How exciting watching two kids helping each other to reach the book. 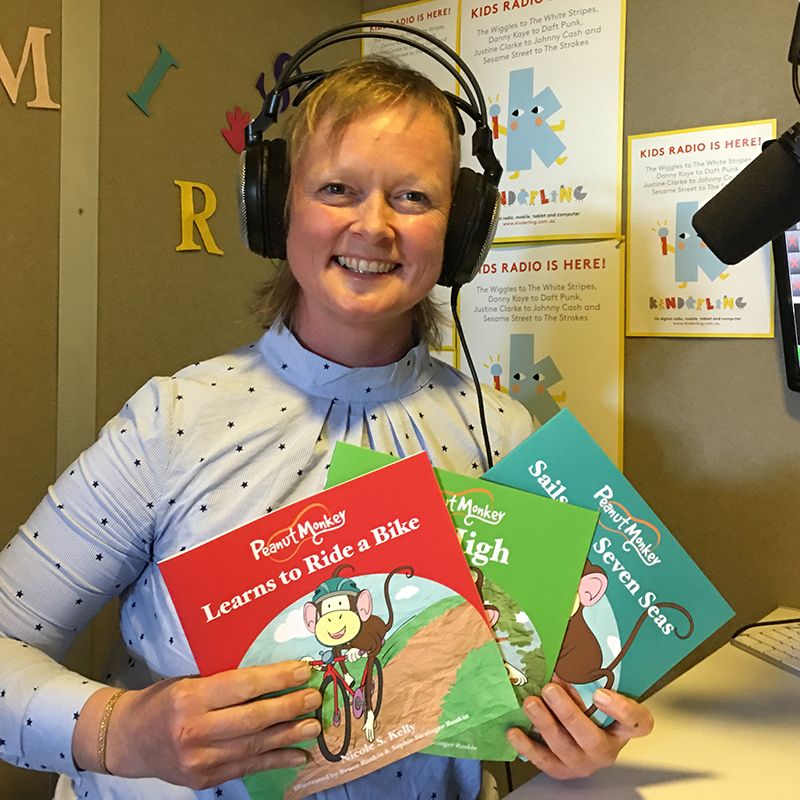 A whistlestop trip to Sydney in August was highlighted by visit to Kinderling Kids' Radio studios for an interview and storytelling session. The stories will be available on Kinderling Kids' Radio really soon. Meanwhile, you can listen to Kinderling live or download their digital radio App.